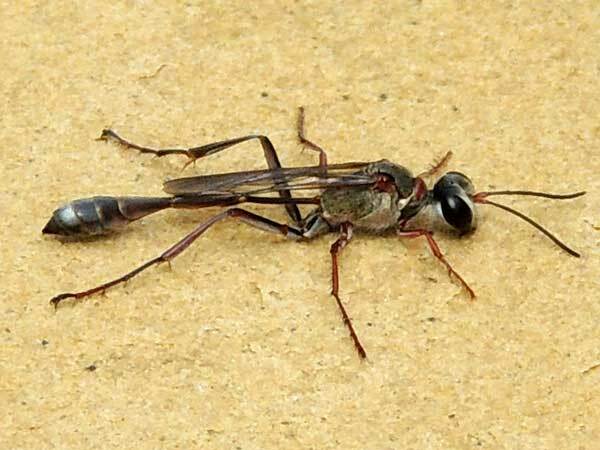 Kenya Natural History Guide >>> Insects >>> Wasps, Bees and Ants - Hymenoptera >>> Ammophila ? Nesting is generally by digging an unbranched tunnel in sandy soil, but provisioning can be progressive, the mother bringing prey as the larva requires it, or mass provisioning, where each nest is provided with a single large prey item, or as many small prey items as should be required. Prey selection depends on the species available but mostly moth and sawfly caterpillars are chosen. Copyright Michael J. Plagens. Page created 22 Sept. 2017.